A peasant family for grappa. The modern state-of-the-art Roccanivo distillery owned by the Berta family at Casalotto di Mombaruzzo opened in the grape harvest of 2002, a historic vintage for this family/business and for the economic development of the Asti wine sector. Other important dates for the company/family are 1947 (construction of the first distillery in Nizza Monferrato), the 1930’s (opening of a Berta pharmacy in Milan), and July 11, 1866 (Francesco Berta’s birth in Casalotto di Mombaruzzo). At the time this boy was born, in a country known for its numerous vineyards, his destiny set in the world of wine, there existed a world entirely different from today’s. Rome was not yet the capital of Italy; the Expedition of the Thousand Soldiers led by Giuseppe Garibaldi had just concluded; Victor Emmanuel II still reigned, famous for his love for food and wine as well as for the campaign of Italian unification. As in all peasant families, Francesco Berta worked since childhood in the vineyards and cellars, and at a young age had a unique foresight, always on the lookout for opportunities to sell his wine and find new customers. As soon as he became of age, at 22, Francesco married Erminia Barbero; his son Giovanni was born in 1889; and 16 years later, another son, Michele, was born. 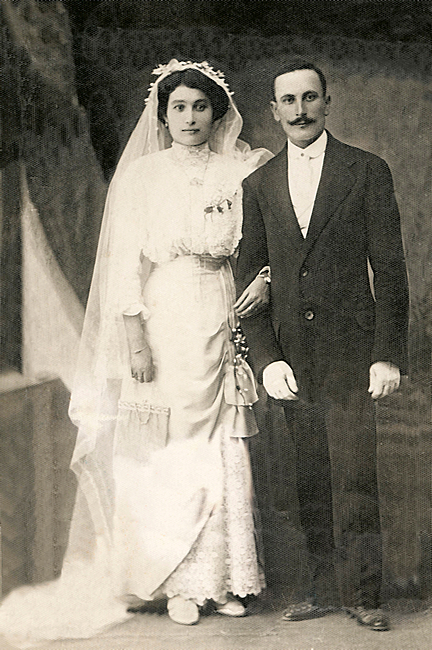 According to rural customs of the time it was not traditional to divide property, it was up to the first-born Giovanni to continue the work of his father, while the second-born child was destined to follow a different line of work; for Michele, the family proposed a career as a pharmacist. The career path that Francesco chose for his child was unusual for the time (since the second child was often sent to the seminary), but very significant for the entrepreneurial future of the Berta family. The pharmacy (which Michele would open in the thirties in Milan) was indeed an ambitious objective: although it was not yet the important business it is today, it represented a world of high prestige: it was a field of treatment but also of research, with a scope so vast as to include herbalism as well as chemistry; artisan production of liqueur was common for its therapeutic benefits. The two brothers worked together though at different cities, and Giovanni, who married Paolina Boido at 24, supplied Michele with base wines for some of the products he created: The Barbera chinata red wine and the elixir of raisin wine Moscato, provided in bottles, but also in glasses in the pharmacy. At the same time of course, Michele’s customers became preferred buyers of Giovanni’s traditionally-made wines, buying directly from Casalotto. Thanks to this opening in Milan, a paragon for those times, the Berta family Roccanivo distillery at Casalotto di Mombaruzzo sought to expand its business towards the cities of Genoa, Turin, Brescia, Bergamo and others, creating respectable circuits between producers and consumers, consolidating the culture of wine for a century, not only through a dependable relationship among individuals but also thanks to the valuable mediation of expert and competent shopkeepers Francesco Berta’s intuition had given the family a secure and modern perspective, which in the meantime was reinforced with the birth of his grandchildren: Francesco, Teresina, Erminia, Maria and Paolo. Their positive contribution allowed the Berta family to easily overcome the terrible crisis following the First World War, which severely damaged the wine economy. Led by a mayor called Vigna - a fitting name, as it means ‘vineyard’ -, the national battle began right in Asti, against the metropolitan wine tariff, a tax hated by farmers and consumers alike, which soured the relationship between the country and the city; entrusted to private companies, it was plagued by blackmail and extortion, and worse still, this tax was collected before the product was delivered. Paolo, the youngest of five children, was to inherit the business, and with great sacrifices was able to continue his studies; while the Second World War raged, he graduated as oenologist in Alba in 1947. He continued the agricultural business of his father Giovanni, but expanded it by opening the ‘Distilleria Berta di Berta Paolo’ in Nizza Monferrato on Via San Nicolao, a historic site where today stands a spirits ageing facility. Note the concurrence between the opening of the distillery and Paolo’s marriage to Lidia Giovine from Canelli: this is a story founded on the family, which gives the company strength and perspective. The Berta company could never have had such a history, had it not been built solidly, based upon the family unit, on the integration and progressive change-over to the following generations, as well as the contribution of the women of the family. Although the family name is carried by the men, in keeping with the family’s rural tradition, the wives have always played a key role - as usual in the countryside - running the household and allowing their men to take care of the business. Paolo developed his aptitude for distillery after his first work experiences as Oenologist for the region’s wine houses; the idea was to produce grappas and liqueurs, seeking for a new added value for the family business wine products. Curiously enough, he first received recognition for his artisanal work from visitors from Germany, Switzerland, USA and Australia, who had come to visit the great sparkling wine factories in neighbouring Canelli, early pioneers in business tourism industry. Step by step the small Nizza Monferrato distillery became internationally renowned for its products packaged in special ceramic and unique crystal bottles. Paolo and Lidia continued their work in the artisanal part of the business, focusing resolutely on high quality selection: Berta products are clearly to stand out due to their first-class quality. In the meantime, the family grew: in 1956 Gianfranco was born and in 1960 came Enrico. Both studied accounting for commercial and chemical purposes, and they dedicated themselves with passion to the family business, reflecting the same idea as mom and dad’s: to maintain the same spirit of quality, but ready to change the way of presenting and selling products. The Berta family, constantly striving for yet another innovation, arrived at the invention of a new bottle, the Beuta Berta (Berta flask). The normal format found in the analysis laboratories was adopted by the distillery to give an image clearly identifiable with the company’s products. Looking back, it was clearly the right choice, but at that time it was difficult and risky, because it meant abandoning future expansion into attractive markets based on modern distribution. The Bertas confidently took this leap in the dark, turning directly and personally to the restaurant sector and small specialised shops. A choice that today is easy to consider mature and progressive, but which at the time represented the acceptance, above all, of difficult and complex work without any guarantee of success. It was the eighties and the Berta family divided the duties: Gianfranco was put in charge of production, Enrico of marketing, while Lidia continued to make the beautiful bottles, while Paolo continued, undaunted, to conserve a few exceptional batches of grappa, from barrel to barrel, from cask to cask. It is an age-old story, the story of a family, always making long-term choices in the interests of future growth and success for their descendants. Years of intense work, years of research applied to traditional production techniques as well as years dedicated to expertly creating a new market where each of the participants and protagonists get to know each other. Next to the anonymous and cold market created by mass distribution industry, a chain evolved made up of supportive and friendly people brought together by the great grappa, distilled strong and pleasing. Although this grappa is made following ancient traditions, they gave it a modern twist, rich in aromas, softness and balsamic sensations on the palate. These were the years when customers, invited by Enrico, began to visit the Nizza Monferrato distillery, strengthening bonds that put people before mere economic self-interest. Enrico and Gianfranco personally met thousands of restaurant and wine shop owners; every day brought someone new who had heard of the distillery by word of mouth. In these years the current Berta Distillerie srl was born, after a period under the name of Distilleria Berta dei figli di Berta Paolo & C. Snc, which was founded in 1990 when Paolo and Lidia officially went into retirement, but never abandoned their own creation. 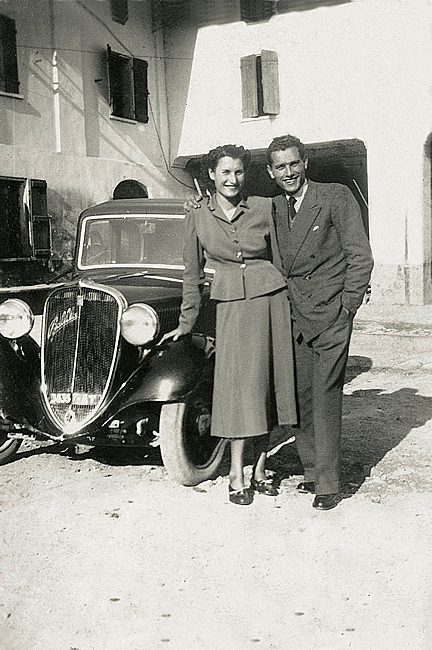 Three years earlier, Simonetta Ghignone had married Gianfranco, adding to the workforce of the family business, taking over responsibility for the administration. In 1989 Annacarla was born and in 1995, Giulia, the daughters of Enrico and Elisabetta Malfatto. Thus, the role of women in the Berta family/business was confirmed: the future of these grappas is increasingly feminine, not just because more women are developing a taste for this type of product, but because they own the industry. Great years of intense work and continued growth, as exhibited by the distillery at Nizza Monferrato, which expanded and specialized including a new discontinuous bain-marie distillation system using boilers. An original technique was also devised for preserving vinaccia (grape pomace left after wine has been pressed): thanks to special hermetic containers, the grape pomaces are kept fresh and damp for the time necessary to be used in distillation for the entire duration of the prolonged work season. Meanwhile the number of wineries continued to grow, from numerous regions of Italy, all wishing the distillery owned by these young Piedmont lads, capable of interpreting modern taste, the one to distil their grape pomace. In addition the number of foreign markets also increased, with more than 60 countries currently importing Berta grappa. It all started one night in July 1997, drinking Barbera wine in the Berta family tavern. As always at that time of the year, the men and women talked of their hopes for a ‘great harvest’, encouraged by the exceptional anticipated maturation , which could be seen in the vines; not a proper dinner, but a ribota or informal get-together, eating bread, salami and robiole cheese, with all products, of course, coming from the Asti region. Someone pointed out, with amused pride, the happy paradox of the Asti resident used to nonchalantly combining the century-old tradition of taverns with the Italian supremacy of first-class restaurants. Guido Alciati had recently left, a man who had always believed in his country, with a love and rigour that put him among the great Italian restaurateurs. “To love our land, that is the point”, someone had said, and someone else added: “To love our history, our art and our culture”, and then also… “To love our countryside, our castles and farmsteads” “To love our cuisine, which changes with the seasons, faithful to nature’s cycle”, “To love our hills, the ‘breasts of Monferrato’ of Pavese reminiscence, with their vines” “To love the land of Asti and to do anything for it”. This is the dream of Hastae. The Roman name for the ancient city of Asti, universally recognised as a place symbolising wine, was chosen to designate this association, and became the symbol for a project bringing together six families of ancient wine tradition united to promote the image of Barbera d’Asti, the territory and its origin. Belonging to the group: Berta, Braida, Michele Chiarlo, Coppo and two Alba houses, Vietti, and Prunotto, part of the Antinori group of Florence. Quorum is a symbol of mutual commitment, a wine and a grappa obtained by contributing with the best Barbera wines that each of the families has produced in its own vineyards. Grappa is the natural end of the production process. A project that has been able to stir the interest of the market and has enabled the six companies to materialize their love for their territory, its culture and art, donating part of the profits to social-cultural investments of great importance and prestige. In 1994, the old company, now over a hundred years old, further expanded, opening the tavern, a house for friends, where you can find, in cozy atmosphere, not only Berta grappa but also the wines of the Berta family friends. The guest list of visitors and grappa lovers extended to include many friends from the world of entertainment and sports, as well as artists, writers, elite restaurateurs, and he great Italian winemaking families. Paolo always said that there would be great demand for outstanding grappa, patiently aged in small precious wooden barrels. Thus, in 1994, the first selection of Reserve wines is ready, and the Berta family, feeling somehow frightened, presented this novelty to the market, a market of connoisseurs who immediately declared it a triumphant success. Roccanivo, the grappa from precious Barbera grape pomace aged eight years, anticipated a new style of grappa, strongly bearing the Berta mark, serving as a model for those to come, and consolidating its dominance year after year. Next came Bric del Gaian, from Muscat grape pomace, also aged for eight years in small barrels; and then the Tre soli tre, from Nebbiolo da Barolo grape pomace aged for eight years in barrels, and then later the Riserva del Fondatore Paolo Berta, with a twenty-year ageing process, and finally, Magia, distilled from grapes aged for ten years. The round, heavy, protective bottles, with their elegant gold script, kept in dark walnut wooden cases. In 2002, on the eve of the harvest, the moment when the Berta family’s address took back the place-name of Roccanivo (Casalotto di Mombaruzzo). A large structure, that decided to expand further, built with a careful sense of ist relation to the vine hills, where it peacefully sits, with a façade of a simple house, displaying the family name on the frieze. It is a house belonging as much to grappa as to the Berta family, open and comfortable, decorated with the coats of arms of all the surrounding regions, where wine is produced with artisanal mastery and stateof- the-art electronic systems. In a warm and cozy atmosphere, the steam-powered stills work slowly and rigorously, to transform the damp and aromatic grape pomace into something strong, but at the same time soft and subtle. Visitors are sheltered by an antique wooden roof and breathtaking, striking views of the hilly landscape. The Berta Distilleries have become not only an obligatory stop on any itinerary dedicated to food and wine lovers flocking to these hills, but also continue to be the destination for so many friends from the world of entertainment and sports, artists, elite restaurateurs, and the great Italian winemaking families; all brought together by ‘that unmistakable aroma of freshly pressed grapes’. The Berta house honours the ancient and valuable culture of hospitality, in keeping with the spirit of union and collaboration with all who work in the area. Elegant, refined, nostalgic, the grappas of today, the final result of a culture that evolved from a solid tradition, but is driven by the pursuit of the qualification of good food and grappa. Thus the Berta family opened its tasting room to offer the widest possible array of products typical of the region. At Casalotto di Mombaruzzo the very best food and grappas are on display and there are many delicacies from the hills of Asti: the Mombaruzzo amaretti of the Berta and Moriondo Carlo.